Description: is one of the oldest hot spring in Japan almost 350 years ago. 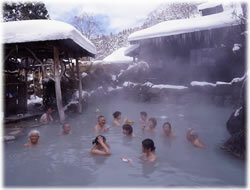 They have indoor and outdoor hot spring baths same gender and also a mixed outdoor hot spring baths. Tsurunoyu Onsen serve a traditional Japanese meals and the have only 2 meals plan. They also have a shuttle bus service available from JR Tazawako train station. Cancellation and prepayment policies vary according to this ryokan and us.